Ah, the joys of parenthood! From the minute your baby is born, your whole life as you know it ends and a new chaotic, sleep-deprived, crazy and terrifying new life begins. It’s easy to become overwhelmed by your new constant responsibilities and never-ending tasks, but the good news is there are ways to limit the chaos. 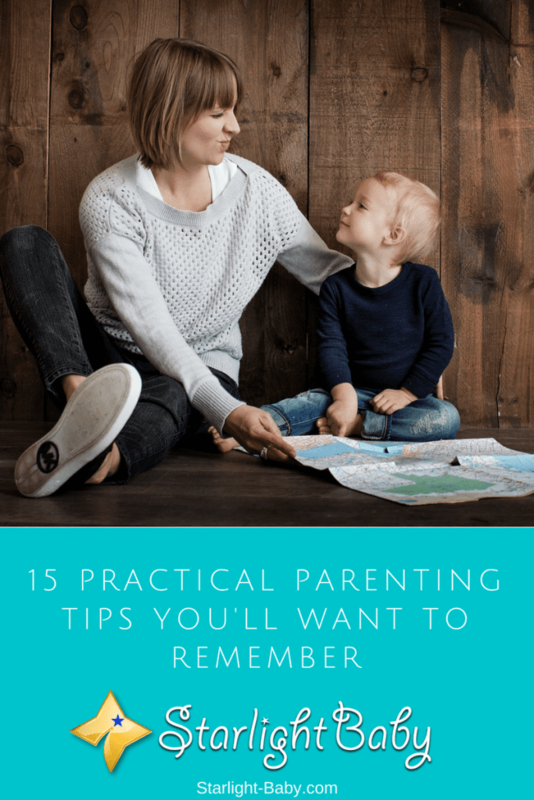 If you’re desperate for advice on how to survive the whirlwind that is the first few years of parenting, below you’ll discover 15 great practical parenting tips that you’ll want to remember. One thing many parents are unprepared for when baby is born, is the amount of time they need to spend in the doctor’s office. Your little one will need to see the doctor a LOT in the first year. From getting them frequently weighed to having simple health checks and vaccinations if you’re having them done, you’ll seem to spend half of your life at the doctor’s surgery. Then when you’re not there, you’ll be on the phone to the doctor in a constant panic over the many different illnesses your baby seems to develop. This is why it’s so important to choose a pediatrician that’s easy to work with. It’s exhausting and very easy to forget these appointments with the million and one other tasks you need to get done. So, to help it’s a good idea to invest in a calendar, or even better – an app which automatically reminds you of important appointments. You’ll also want to keep your doctor’s information, along with any of your baby’s medical records, at hand ready for those frequent appointments. Swaddling is a real sanity-saver, helping to instantly calm baby and help them drift off to sleep. There’s definitely a knack to doing it right, but you can always ask your pediatrician to show you how it’s done, or you’ll find plenty of instructional videos on YouTube. It basically involves wrapping baby up tightly in a blanket, restricting their movement. It works because for around five months, your little one has what is referred to as a “startle reflex”. This causes them to feel like they’re falling which can cause sudden bursts of crying and cause them to wake up distressed. Swaddling is seriously one of the best practical parenting tips you can follow – just make sure you’re doing it safely. One of the key things you quickly learn as a parent is that life with little ones is unpredictable. From unexpected illnesses to temper tantrums and random sleepless nights – you’ll face a wide variety of unpredictable circumstances that can really throw you off your schedule. It’s therefore vital you leave space for flexibility in your daily routine. Any activities you plan, be sure to add on time both before and after to account for anything that can (and probably will!) go wrong. If you try to organize a tight, strict schedule, you’re going to find yourself frequently stressed out and late for practically everything. Some days you’re going to find it tough to prepare proper, nutritious meals. When you’re already running on very little sleep, this can play havoc with your mood and cause you to move a lot slower than usual. High-energy snacks will help boost those energy levels when you need it most. Think nuts, soda and the occasional high-sugar snack. Just try to limit the amount of “junk food snacks” you consume and focus instead on healthier alternatives. Exercise? When on earth do you have time to fit that in? Let’s be honest – the thought of exercising after a long day of parenting isn’t very appealing! Some days, you’re going to get more than enough exercise simply picking up and looking after your child. However, it’s easy to let your exercise routine slip once you become a parent and it can have a negative impact on your health. Exercising regularly will actually make it easier to look after your little one. It helps to provide you with more energy, something you’ll definitely appreciate and could do with! It also helps to stabilize the mood and makes everything much easier to deal with. Whether you take 20 minutes to half an hour out in an evening, or whether you incorporate exercise into your daily childcare routine (taking the kids to the park, or on a long walk for example), it’s important to ensure you keep moving. Your time suddenly becomes much more limited when you’re looking after a baby or toddler. Ironically, it also seems to become much more requested! A great tip is to set time boundaries to help you achieve a good balance. For example, set a time in the evenings where you switch your phone off. It can be switched off for just an hour or two, or for the whole evening if you’d prefer. This will prevent you not only being interrupted when you’re trying to relax or spend time with the kids, but it will also keep you more relaxed. You can also set time boundaries for chores, work and “you time”. Sometimes you need to be strict with your boundaries, but once you get used to them you’ll soon discover just how much easier it makes your very busy life. One of the biggest mistakes you can make, that’s extremely easy to do, is to compare yourself to other parents. Social media has made this particularly easy to do as you’ll often come across posts from other parents glowing about how well they’re doing and how their children are developing. However, what you need to remember is they are only posting on the good days. These positive, super-parent posts aren’t a reflection of what their life is like on a daily basis. They may not post about it, but they also experience the downsides of parenting. They won’t admit to being overly stressed or so sleep deprived that they feel they’re going insane. Also, every single parent has a slightly different situation. So, another parent may be doing a much better job at appearing to hold it together, but that could be because they don’t have the same commitments as you do, or their child may be different to yours. When you stop comparing yourself to other parents, you’ll discover life is much happier! This may sound like a strange one but choosing the wrong books can make your life a LOT more tedious! You are going to be reading the same books over and over again. So, unless you invest in a huge library of different books for your little one, you’re going to find yourself dreading reading time. So, before buying any baby or toddler book, make sure it’s at least tolerable for the next year or two. You and your partner could have had the happiest relationship in the world before baby came along. However, after a week or two of sleep deprivation, you’re going to argue and you’re going to likely argue a lot! It’s not a reflection of your relationship. It’s a simple fact of new parenthood. When you aren’t getting enough sleep and your stress levels are already through the roof, you’ll find even the littlest of things set you off. It’s easy to take things out on each other, so to help counteract this, try to develop better communication with your partner. This means explaining there may be times you’ll be extra-snappy, and accepting that at times it’s going to be hard. Then, once these arguments do occur, you can chat about and resolve them in the evening. Maintaining good communication, especially in the early days, is going to make it much easier to deal with the inevitable problems new parenthood brings. If you live in an area with great daycare and preschools, it’s vital you sign your child up as quickly as possible. They fill up quickly and it’s surprising how many parents are left out in the cold because they didn’t get their application in quick enough. So, unless you want your child to end up in a questionable daycare facility, make sure you put their name forward for your preferred daycare as early as you possibly can. Young children love spaghetti and rice, but it’s amazing how messy it can get! You’ll often find half of it ends up on the floor, giving you an epic task to clean it up. One great tip for cleaning up your little one’s messy food, is to let it dry first. It’s actually a lot easier to clean and pick up once it’s dry. Yes, it can get messy, but try to resist cleaning up your little one’s toys throughout the day. If you do this, you’re going to find yourself spending what feels like the entire day just putting toys away. Instead, wait until your little bundle of joy is in bed, then do a clean-up. One thing you quickly learn as a parent is it’s going to be impossible to keep the house clean. Don’t even try to clean up during the day, your life will be much more relaxed and happier if you do a quick clean up in the evenings. These days, it’s all the rage to take babies and toddlers to various groups. From baby yoga and ballet to sensory classes and never-ending play dates; it can quickly become exhausting trying to manage your little one’s schedule! There is some pressure placed upon parents to join as many groups as is humanly possible. However, don’t give into it. Unless you want to spend the majority of your time feeling stressed and exhausted, keep the number of groups you attend limited to just one or two per week. There’s a lot of unexpected things you learn as a parent and one of the toughest is being kicked in the groin area! When you pick up your toddler, be sure to hold them side-on. That way, there’s no way you can get kicked in a sensitive area! There’s no getting away from it – babies and toddlers are messy! From sick-ups to sticky fingers, you’re going to find yourself constantly dealing with all kinds of mess. That’s where a good old trusty box of tissues proves invaluable. Keep a box in each room, so when a messy situation does arise, you’ll be able to deal with it quickly and easily. Overall, being a parent to a baby or toddler is a huge learning curve and it’s one of the toughest jobs you’ll ever do. However, there are some great, practical tips that can help and the above are just 15 of the best. Do you have your own practical tips that other parents might find useful? Do us all a favor and share them below! I thoroughly enjoyed reading this list, and it’s soooo true, every bit of it. I especially liked #’s 7 and 8. For #7, I was so much happier when I stopped comparing myself and wondering why -insert parent’s name- had a baby or toddler who could do -insert whatever activity or milestone- that my daughter hadn’t mastered yet. It was draining to say the least. I finally realized that we’ll reach the same place, just a little earlier or later than others. And #8 about the books… oh my, I can absolutely confirm that one! 🙂 I know so many of those picture books by heart and I’m sure I’ll never forget them, right like the poems I had to memorize for school. I have something to add regarding #1. If you take advice from experienced parents and learn about home remedies, you may not have to visit to the doctors frequently. In the last one year, I took my baby to the health care provider only thrice, that was for vaccination. As far as #8 is concerned, I truly believe that parents should take interest in their child’s books. As an author of a children book, I believe parents should invest in children books. As a new parent, I hope I raise my son to be successful. With so much conflict going on, I hope he does not become affected. I would go crazy if my son grew up and became a drug addict. My girlfriend feels the same. I love you son! You’re right, Boss112091. A parent would do anything to protect his/her child from harm. We could only hope that he/she stays safe all the time, especially when he/she grows up and is somewhere far from our sight. Number one tip is to always keep the plugs out of reach. You’re spot on, Mya. Safety should be a top concern among parents. We should accident-proof our homes, especially those with little kids. As a new parent, I found this article with so many useful tips. I liked the ideas such as swaddling, not comparing with other parents, developing better communication with the partner, and not picking toys throughout the day. Thank you very much for this resource article.